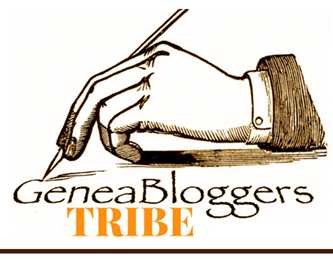 It’s ages since I participated in the 52 Weeks of Abundant Genealogy by Amy Coffin and hosted by Geneabloggers as I’ve been rather preoccupied with my own 52 weeks Beyond the Internet series. 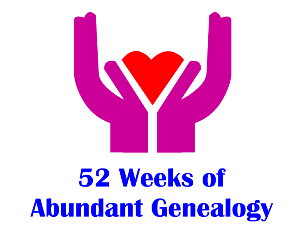 This morning I read that the topic for Week 42 of Abundant Genealogy is Biggest Genealogy Accomplishment. What do you feel is your biggest genealogy accomplishment? What were the steps you took to get there, and what was the end result? My first thoughts turned to an earlier Abundant Genealogy post from Week 7 when I wrote about discovering my Bavarian ancestor’s roots. It was only later that I thought, no that’s not my biggest genealogy accomplishment, even though it was certainly a critical point in my family research. 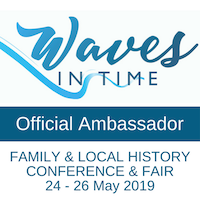 The thing I’m most proud of, genealogically, is writing the history of my Kunkel family in Queensland: a pioneering family who, although not important as individuals, participated in important events in our country’s and our state’s achievements and progress. It was the family’s everyday ordinariness that gave me the name of the book: Grassroots Queenslanders: the Kunkel Family. Thanks to the discovery I mentioned above, and fantastic oral history connections that were uncovered, I was able to include the background story of my Happ-Kunkel families in Bavaria and my O’Brien ancestors from Ballykelly near Broadford in Co Clare, and a little about the other emigrants from Dorfprozelten in Bavaria. 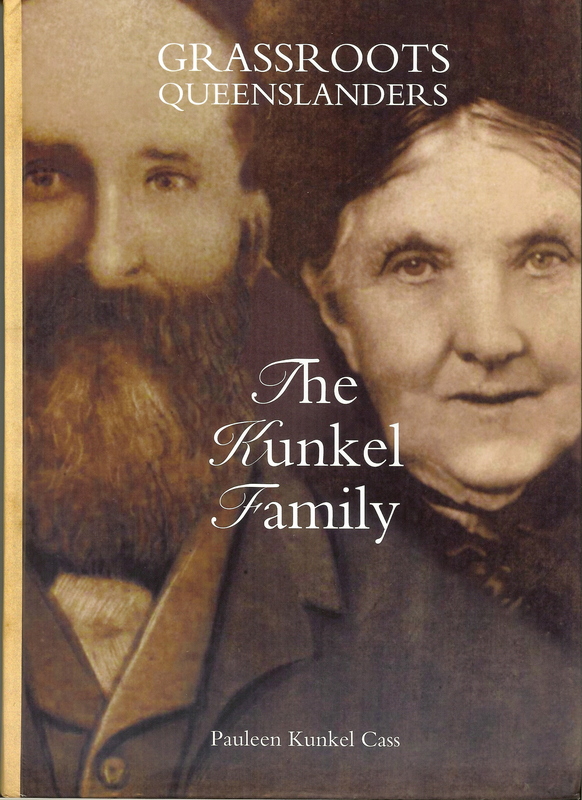 I knew literally nothing about this family when I started out other than the fact Kunkel was plainly a name of German origin, and that my grandfather had several siblings only one or two of whom he had anything to do with. I also knew that he had originally been a Catholic and one of the points of contention had been his marrying a Scots Presbyterian. My research started in the pre-internet era so I accumulated every snippet of information I could find from as many sources as possible. One day I realised that if I didn’t write up this family story, it would become a major regret. So what did I do? One of the strange things I did was to decide not to look at other family histories because I didn’t want to pinch their ideas. In retrospect this was fairly silly as there are so many strategies that can be used – you don’t have to recreate the wheel. Instead I launched in, started writing and kept at it, day after day, until the story came together. I was still working full-time so I wrote in the early mornings and late into the evenings. 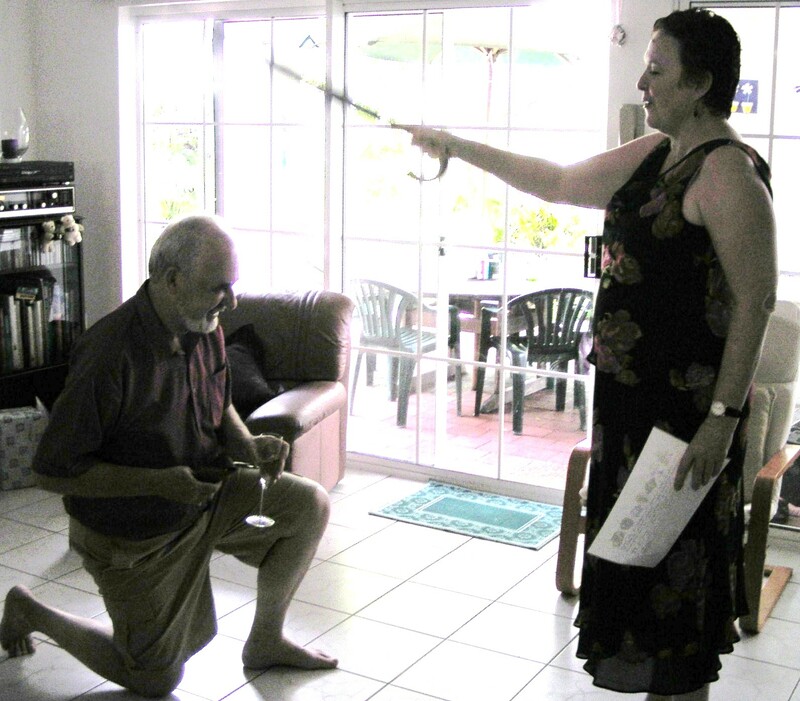 Sir Cassmob is knighted for services to genealogy. As I found gaps in the story I chased down more clues, did more research, and phoned more people. I’m proud of all the research, determination and sheer persistence that went into writing up this story, including challenging my reluctance to contact formerly unknown relatives. Like the Oscars I have to acknowledge that many people helped me along the way with their stories, photos etc, but my greatest debt is to Mr Cassmob, who got a Family Knighthood for Services to Genealogy! I’ve said many times, either the book wouldn’t have been written or I’d have been much thinner. Sir Cassmob receives his award. When I first held my “baby” in my hands I was just so thrilled and besotted. Now of course I can see its flaws, mistakes, and things I could have done differently, but even so it was, and remains, an achievement to be proud of. The book was launched by one of my distant O’Brien cousins, who always tells me “oh you’re wonderful” but what she really means is that I’m quite mad to keep doing all this family history. 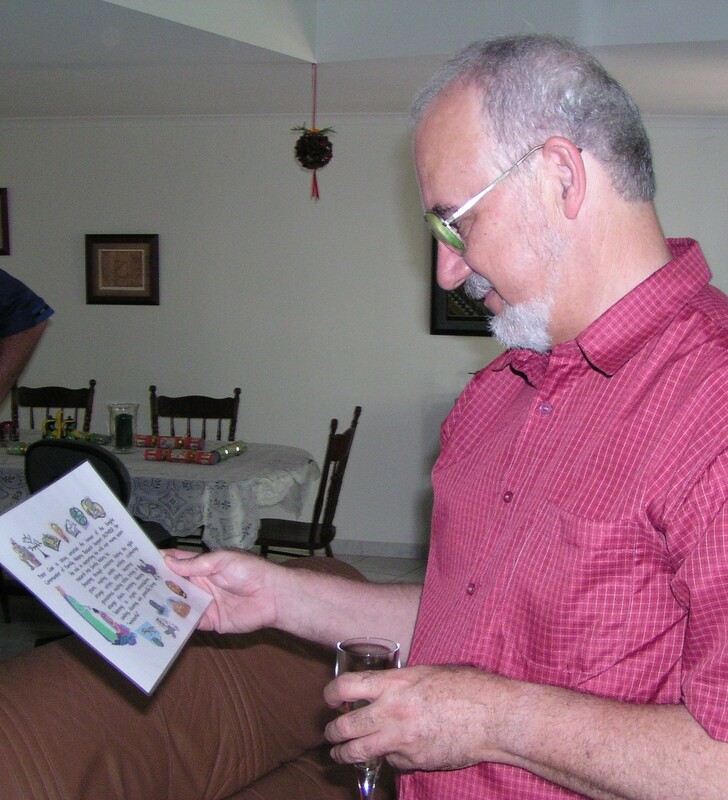 We launched the book in Toowoomba not far from where the family had lived for many years and as far as is known it was the first Kunkel family reunion in close to 100 years. A mob of Kunkels chatting hammer and tongs. It was a great day and there was a non-step level of chatter even among people who’d never met before. Many were astonished to discover they had Kunkel ancestry and everyone appreciated learning more of the story. 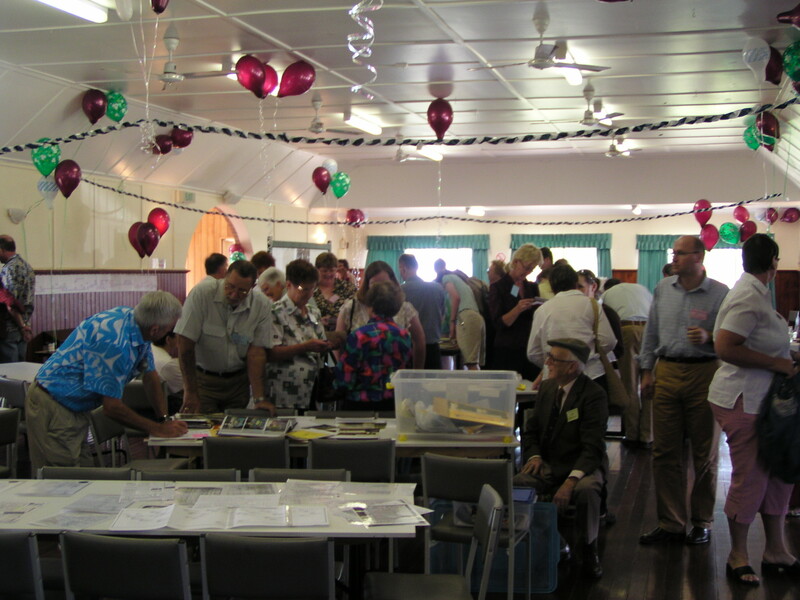 The genealogy chart stretched along the walls and everybody had fun finding their name. Another great thing, retrospectively, is that quite a number of the third generation of Kunkel descendants were able to attend even though in their eighties or nineties Many have now left us so it was a special privilege to have them there. The reunion and all the pleasure people got from it and from the book was definitely the icing on the cake. My beautiful Alexander Henderson Award was hand-delivered to the GSNT. The glitter on the cake was winning two awards for the book. 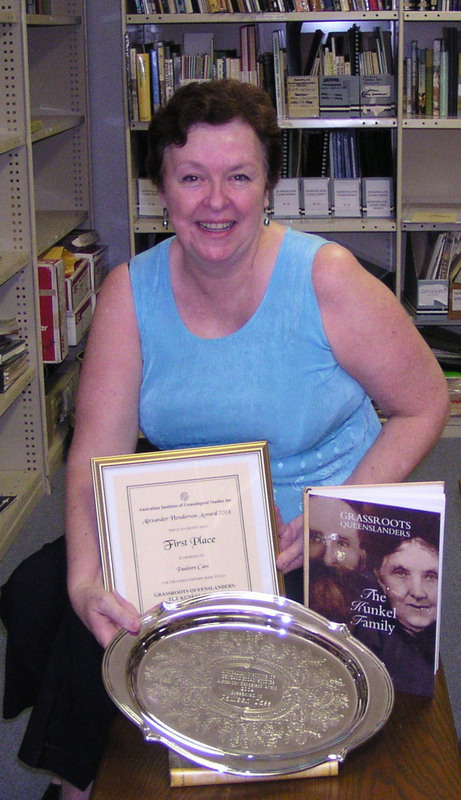 I was so proud to be joint-winner of Queensland Family History Society’s annual award with Joyce Philips’s book The Wrights of Tivoli. And then to my utter astonishment I also won the Alexander Henderson Award from the Australian Institute of Genealogical Studies. I was over the moon with excitement and pride as you might imagine. It’s very counter-cultural to blow one’s own trumpet, certainly in Australia where there’s an absolute dislike of people who puff themselves up, so it feels very brazen to be telling this story. There’s something special about knowing you’re leaving a family history for posterity and that you’ve opened up your family’s story to many family members. It’s certainly one of my proudest moments. 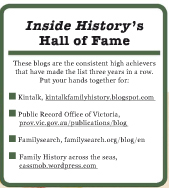 So if you’ve been thinking of writing your own family history, give it a go and don’t let the fear stop you. I guarantee you will be so pleased to have provided this inheritance for generations to come.